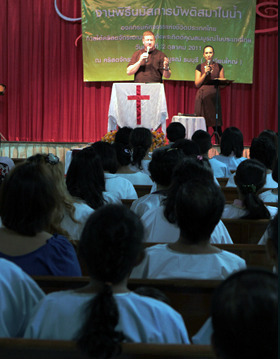 Crusade ministry is a large part of what we do here in Thailand. We have conducted mass crusades in many different areas all over the country that have never had any type of outreach. Many of the people who come to crusades have never once heard the name of Jesus or that there is a God who loves them. During a crusade, we preach the simple gospel, and there are always many people who accept salvation and many miraculous healings that follow. The locations of these crusades are always within easy distance of a THP church or home group where the brand-new Christians can be disciple and establish in God within a community of believers as they grow. Not only are there crusades held when the John Smithwick Ministries International (JSMI) team is here, but we have also trained a Thai team who has been traveling around and ministering to their own people and making a huge impact on this precious nation for Jesus! We consistently come across many testimonies of individuals and even whole families receiving salvation, being physically and emotionally healed, and being set on a path to serve God! How can I help? – You can learn about helping fund a crusade by emailing and asking for more information! You can also be a part of a JSMI Global Ventures Team Trip and experience one first hand! Training up effective leaders is one of our main goals in the Thailand Harvest plan. Once monthly, all of our THP pastors from across the nation come together for a few days of training, refilling, and fellowship. Our Leadership Training programs, however, do not only include equipping our pastors with the skills and opportunities that they need, but we are also able to equip and train church members in areas of evangelism, helps ministry, and one-on-one discipleship. We have had the awesome opportunity to train a Thai Evangelism Team consisting of both pastors and church members, who has been preaching the gospel in crusade settings and participating in follow-up ministry with new believers. The Thai Evangelism Team is continually growing as nationals are using what they have learned to train more nationals on how to change their nation with the Gospel of Jesus! We have also had the privilege to train a Youth Evangelism Team full of young people who are passionate about seeing their generation changed by the Power of God!